Contracted by Air Centers of Florida GENERON has manufactured and supplied a Generon model NS-48-94-120 PSA (Pressure Swing Adsorption ) system to our distributor Air Centers of Florida. The system will provide 302.5 scfm with a purity of 99.93% nitrogen. The Generator is 7’4″‘ x 7’4″ x 11’8″, which GENERON builds and certifies at their Houston, Texas facility. 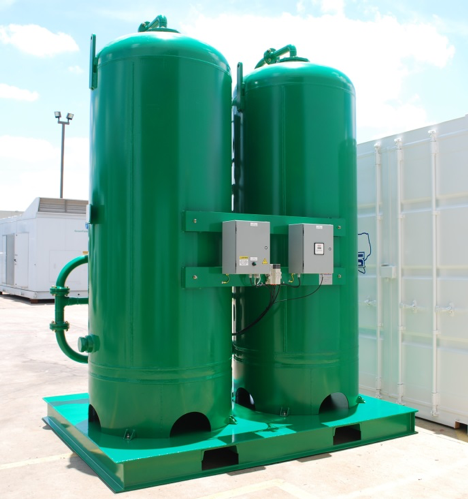 To compliment the GENERON® system, Houston Vessel Manufacturing, an affiliated IGS company, supplied the vessels for this package. : To see how GENERON can meet your nitrogen needs, contact our sales team at [email protected] or call us at +1.713.937.5200.